Visit us on Flickr and reminisce many beautiful moments. Subscribe us on YouTube for upcoming issues of "Jubilee-TV". Do you have questions? Do you want to participate? Would you like to support the University's jubilee? Please contact us. 175 Years of "Museum of Art"
Kipp: "We will remember this year for a long time to come"
At the end of a year that was in many respects very eventful, Kiel University will be exiting its 350th jubilee with a big THANK YOU. After Christmas, posters across Kiel will be passing on the messages that the state university stands for today, as a "final official act" for the jubilee. The thank you campaign, which is being supported by Ströer Deutsche Städte Medien GmbH, is one of the joint projects for the jubilee year with over 35 cooperating partners plus numerous committed university members. Professor Lutz Kipp, President of Kiel University, is absolutely sure that "the unbelievable diversity and variety that was present in the jubilee year would not have been possible without these joint campaigns and the fantastic support throughout the city and state!" 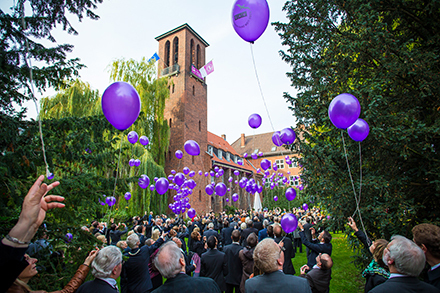 The jubilee of Kiel University, its 350-year anniversary, will be a year of festivities for the city of Kiel and the state of Schleswig-Holstein as well as for all people who feel connected to the university.